In this post, we examine 5 of the best-selling stair treads. There are 2 outdoor options, the Rubber-Cal, which is industrial-strength grip, and the Puchan outdoor tread, which is more decorative. As far as indoor treads go, the Softy Stair runners are our highest-rated option- they muffle noisy stairs while also providing traction against slip-and-falls. Stair treads can be made of various materials, but they’re usually made from heavy duty fabric or rubber. People attach them to bare wood stairs to give them better traction when going up or down. They’re especially useful for when you have young children or elderly pets who might have trouble negotiating stairs (Source). Stair treads work by providing additional grip to your feet when you’re walking up and down stairs. Bare wood steps — while they look great — are often slippery and can be a hazard when going up or down. In addition, outside steps can become treacherous with rain, snow and ice. Treads make steps safer. Buyers recommend purchasing double sided carpet tape to help keep stair treads in place even if they advertise they have a ‘no-slip’ backing. It’s also suggested to clean the surface throughly before securing the treads to the wood. This will help to keep your treads securely in place (Source). While the Rubber Cal mats can be used inside such as in the garage or an unfinished basement, their no frills black rubber design means they probably won’t complement your home’s decor. Buyers say these mats stand up to rain, sun and snow, which make them ideal for outdoor use or use in commercial settings. They’re easy to install by nailing them down, using two sided tape or some other adhesive such as Epoxy Nose Caulk (Source). 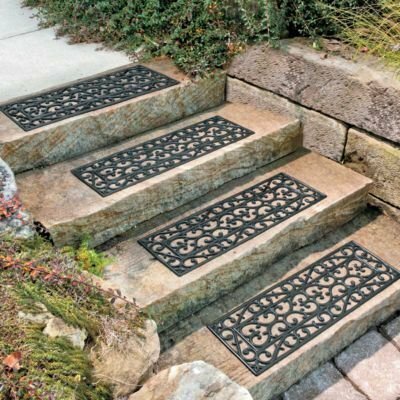 The Puchan-LM Outdoor Stair Mat Treads have a more fancy design than does the Rubber-Cal and is best used on icy porches or steps leading up to the house. While stylish, buyers voiced concerns over the mat not staying in place without some additional adhesive and the long term durability due to the mat’s thinness. Next we looked at the Softy Stair Treads. Made from polypropylene, buyers said these treads do tend to stay in place on their own, but say that adding two sided carpet tape is ideal for creating a stronger bond. On the negative side, it was noted that this tread is a little on the thin side so the durability over time is questionable. The Berrnour Home Stair 7 piece treads are soft and help reduce noise while walking down the stairs in addition to adding traction. These treads are plain beige, which some people might find too plain for their decor. Like many stair treads, buyers recommend securing these with some double sided carpet tape. Lastly we looked at the Brown Floral Stair Tread Rugs. These feature a modern design and a no-skid rubber backing. The kit comes with 7 pieces and buyers say they clean up quickly with warm water and soap. This set gets high marks for their price to performance value. 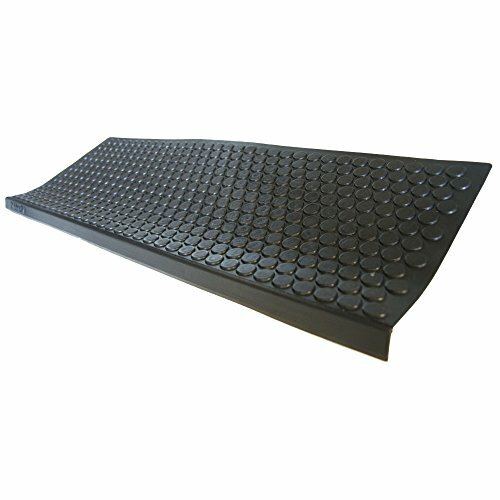 The Ottomanson Non Slip Stair Tread Mat is a good option if you need durable stair treads that are designed for interior residential applications. Users like the softness of the mat,but some do complain about the treads being cheaply made. This set of 7 softy stair treads made of 100% polypropylene provide elegance and comfort while reducing noise and protecting your stairs from scratches, wear and tear. They feature a long-wearing surface pile and non-slip rubber backing. These stair treads provide safe traction and stability on hardwood, tile, stone and marble stairs. They are available in 4 colors (beige camel, brown, dark grey and red). This item might be a good choice if you’re looking for a charming addition to your home décor which will at the same time create a safer, more secure walking surface for your family by reducing the likelihood of slips and falls. In general, buyers have a favorable opinion of the Ottomanson Skid Resistant Stair Tread Carpet. They agree that they are super soft and comfy to walk on bear-foot. One satisfied user shares that her dog is no longer scared to go up and down the stairs. All in all, users recommend the item for safety and protection of hardwood stairs from dog scratches. However, some buyers complain that the treads are cheaply made. As they state, the mats never stay in place because they stick to your socks like Velcro. One very dissatisfied buyer shares that several of the treads have mismatched shapes – instead of rectangular, some pieces are awkward-sized trapezoids. 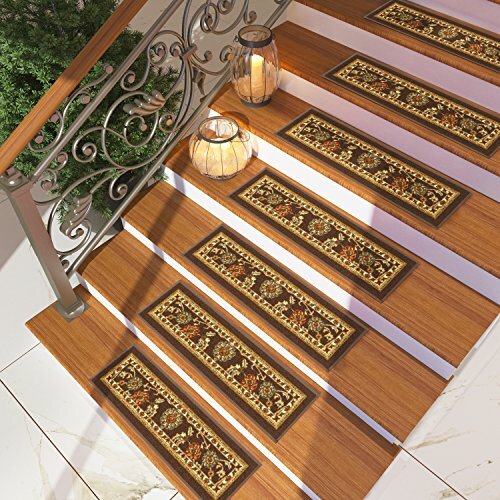 The PUCHAN-LM Elegant Outdoor Rubber Non Slip Stair Treads Mat might be a good option if you want to provide charm as well as firmer footing on entryway steps. Users love the elegant look of these stair treads, but do complain about the back side being very slick. This product is a set of 4 outdoor stair treads made from a sturdy rubber which keeps treads from sliding around. They have an attractive open scroll design which allows water and slush to drain through. This item could be a good choice if you want to add a touch of style and safety to your entryway stairs. In general, users have a favorable opinion of the PUCHAN-LM Outdoor Black Rubber Scroll work. They agree that the stair treads are durable and of good quality. Users like their elegant design in particular. However, many buyers complain that the mats are thin and thus move easily by those in a hurry. Some even say that they slide around too much to be safe. Users would prefer if they were thicker and sold with a compatible wood/concrete adhesive to save time for the consumer. The Berrnour Beige Skid Resistant Stair Tread Mats could be a solid option if you want durable non-slip rubber back pet-friendly stair treads. Users like the softness and durability of these mats, but some do complain about them being slippery. 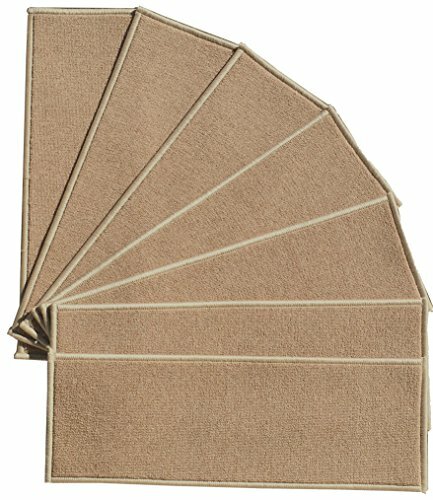 This product is a 7-piece beige colored stair tread mat. Each piece measures 9’’x26’’. These stair treads might be a solid choice if you are looking for inexpensive machine-washable stair mats. The general user consensus concerning the Berrnour 7-Piece Rubber Backing Non Slip Stair Tread Mats is that they are soft and durable. Many buyers state that they are perfect for older pets that navigate stairs. However, some buyers state that they are more slippery than hardwood stairs and therefore not safe. If you are looking for stair treads, you might want to consider the Home Way Black Floral Stair Tread Rugs. Users like the quality of these stair mats, but some do complain about the item sliding. This product is a 7-piece non-skid easy-to-clean stair rug set. The rugs feature a non-skid rubber backing which enhances safety and prevents slipping on hardwood floors. You can choose from the assortment of 11 designs. This product could be a solid choice if you want to reduce noise and wear and tear on your hardwood stairs. In general, users have a favorable opinion of the Home Way Non-Slip Non-Skid Stair Treads and they agree that they are of good quality, easy to clean and thin yet sturdy. However, some buyers complain that they don’t stick to the stairways well. They add that you will need a carpet tape to keep them from moving. If you’re looking for top-rated stair treads which are designed to reduce the chances of slip-and-fall accidents occurring on your stairways, you might want to consider these offered by Rubber-Cal. Users love the usefulness of these rubber mats, but some do complain of the strong odor. These non-skid step mats are made of a mixture of natural and reclaimed rubbers, making for very durable products. They feature a coin-patterned surface texture which increases grip and traction for your feet as you go up and down stairways. If you want stair treads which are suitable for stairways in residential, commercial or industrial settings that will resist damage from outdoor elemental factors such as sunlight, rain, and snow, this item might be a good option. The general user consensus regarding the Rubber-Cal “Coin-Grip” Non-Slip Rubber Stair Mats is that they work great for preventing slips and falls for both humans and pets since they don’t slip around. The only complaint purchasers have so far is that the rubber stair mats give off a strong odor. Therefore, users suggest using them only outdoors. Stairs are considered an ordinary part of people’s lives and often we take them for granted. But sometimes they can be a reason for a slip or a fall that can be really dangerous. Such accidents can happen at municipal, residential or commercial locations. Studies indicate that each year there are more than 1 million accidents that involve unsafe stairs in the US. According to National Safety Council, every year there are over 10,000 people that die due to falls that involve stairs. Age plays an important role here as mainly children and elder people are at risk for such accidents. However, there are in fact steps that can be taken for minimizing the risk of such accidents. One of the options for preventing them is installing treads on surfaces of the stairway. Such innovations like Glowline which is glow-in-the-dark stair treads provide better visibility to your stairs even when the room is poorly lit. 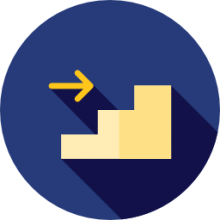 In addition, Amstep offers Nightline, an anti-slip stair tread which is mainly helpful for those people who have vision impairments, or for dimly lit locations. You should also keep them clean by purchasing a specialty vacuum for stairs. Steps and staircases that are broken, worn or cracked are unsightly and can reflect both on the building and the people occupying it. But it is not cheap to pour new steps or replace the stairs. While renovating stairs with anti-slip stair treads, non-slip coatings and stair nosing, Products offered by Amstep, can help you save both money and time. These products provide the building with a beautiful appearance, and can as well be made in any color or size. Start protecting your family members, guests, staff, and customers today.